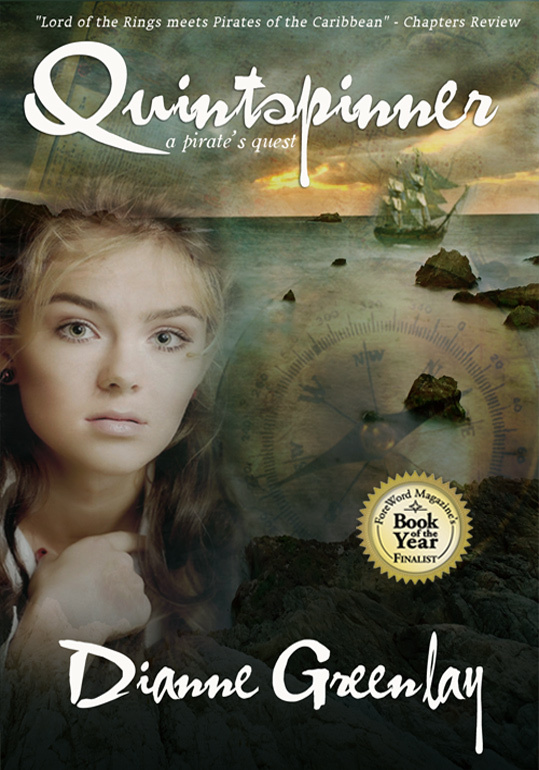 I have a debut novel, “Quintspinner – A Pirate’s Quest ” published, with Book Two of the intended trilogy just a smidge away from being finished and ready to publish as well. I published Book One in 2010 through iUniverse, as I was brand new to the world of self-publishing or indie-publishing (whatever term you are comfortable with) and a complete technophobe. About this time, a friend sent me an article on the rise of self-publishing and within the article was some sort of rating system of the available services out there at the time. iUniverse scored well in the ratings. and Lisa Genova, well-known author of Still Alice had first published with them. I emailed her and asked if she had been satisfied with their book creation services. She replied that she had been very happy with iUniverse and felt that, without having gone through them, her book would have still been sitting on a shelf as an unsold and unpublished manuscript. ( She was picked up by one of the big publishers after she had marketed her novel herself). Rating: 3 (There are better options out there now) You can get your books edited, formatted by a professional, and have an awesome cover made (The Book Designer ; Creativindie Covers ; extendedimagery) for FAR LESS money than my package cost me. **However, if you have more money than you have knowledge in the area of getting your book published, they DO offer a very complete and professional package and are very helpful. It’s one-stop shopping to get your book out there. 2. Book Awards – I got caught up in the need for validation and entered 20 of them (what can I say, other than a previously undiagnosed OCD seemed to have manifested itself…) However, Quintspinner won 14 of the awards in Best YA, Best Historical and Best Commercial divisions . (Woot! Woot! puts a smile on my face) I got a couple of small cash prizes ($100 or less) and listings in online publications, but no boost in book sales (takes the smile off my face …) Honestly, I don’t remember what I spent in entrance fees but they ranged from $25 to $125, so you do the math. I really hoped that listing the awards it won on either my book’s front or back cover would tempt some readers but I don’t think it has. Rating: 2 (I’m still proud of the awards and people still come up to me and mention them, but I wouldn’t enter them for most or maybe any of my future books). 3. Book Launch Party. (key word being Party). It was a fun-filled evening: we sang ribald sea shanties, I gave an author talk about my publishing journey and about pirates and life in the 1700’s (featured in my novel), and an author reading, complete with a stunning live enactment of a couple of chapters in the book, done by a group of rowdy and authentic looking pirates. I served grog to those of legal drinking age and iced tea, coffee, and tea. There were platefuls of hor d”oeuvres with a seaside theme, door prizes, and a give-away of spinner rings ( also featured prominently in my novel). Many members in the audience came in pirate costume as well. I sold 150 books at $25 each, 20 of which were hard-covers at $35 each, and autographed for what seemed like hours. A local bar/restaurant offered plates of appetizers, for the cost of “4 gold doubloons”, (which attendees were given at my reading – play gold coins,) for a post-party get-together at their establishment. Book Launch Party lasted 3 hours. Rating: 1, for a debut author, because it got the word out locally that I had a book published and that it was for sale. It also, through word-of-mouth, got me two author reading invitations at two other cities’ libraries, as they had heard about the “Pirate Book Launch Party”. 4. Numerous author talks at high schools, middle grade schools, and community gatherings, a writer’s meeting, and as, mentioned, libraries. Although fun to do, they resulted in not even a cost recovery in book sales. Rating 3. (Gas costs too much these days, not to mention the time and money lost from my regular day job to do these. 5. Book blog tour – did a 10 blog book tour for the bargain price of $65. You get what you pay for…. blogs that hosted me, chosen by tour planner were not really genre appropriate and had low follower numbers. Even so, the interviews took a lot of time to write answers to, with each one having slightly different questions, and me not wanting to repeat myself too much. Rating 2. If I were to do it again, I would be much more selective with the hosting bloggers. Note: I did some singular author interviews ( Let’s Book It ; drey’s library ; Scribbles and Tunes) and they were followed with a short upward blip in sales. 6. Book reviews – back in 2010, reviewers still wanted paperbacks. Few accepted ebooks. There was then the cost of the books, as well as postage to send them (usually $20 per book for postage, with tracking and insurance); I sent them with tracking availability, as most were going from Canada to the US, and the postal system, on more than one occasion, “lost” the book. Rating 1. I believe book reviews are essential, and now with the growth of ebook acceptability, this is far less costly. 7. Webinars – a great way to increase one’s knowledge level about any topic. For me it was so convenient, without even having to leave the house, to be able to learn from experts about a variety of topics such as how to twitter, how to do attractive web pages, and how to do effective publishing and marketing and I highly recommend Joanna Penn’s How To Promote Your Novel: 21 Ways to Sell More Books Online. Rating 1. Attaining knowledge is a worthwhile thing. And I was sadly lacking in many areas. 8. Online radio interview, CBC radio interview, West magazine feature, University of Sask Green and White Alumni magazine, local newspapers – I have no way of knowing if they helped sell books, but they were free to me, and I can’t help but think they had to be worthwhile in getting my name and novel’s title out there. Rating: 1. 9. Book Fair entry/display – I paid a fee of $175 each time to have my book displayed at the London Book Fair and again at the Book Expo America and the Frankfurt Book Fair. Rating: 3. Total waste of money. Not even one inquiry generated. Rating: 1. KDP Select costs nothing to join, and I will even have a royalty cheque coming for the first time in a very long time. What have YOU experienced as being worthwhile to spend money on, or even pursue for free, in your book publishing journey?